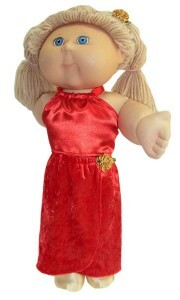 My popular sarong doll clothes patterns in both 18 Inch American Girl and Cabbage Patch Kids are now available with the option to make a short or long sarong. I had to make an evening outfit for a customer at very short notice (like, I had 1 ½ hours to make it and get it in the post for her) and it had to be red! So quick and easy was the first priority when choosing the pattern, but it also had to be stunning enough for the doll to shine at her formal engagement. Well, I got out all my red fabric (I didn’t have time to go to the shops) and laid it all on the table, dismissed those pieces that just didn’t look formal enough and played around in my head with what was left. I knew the halter top pattern looked great as a formal top when I used satin as I sell a halter top and petti skirt on my other website and it looks stunning (unfortunately, I was out of the red petti skirts at the time). So I just needed to make an evening skirt. Yes! The sarong pattern is so easy to make and all I had to do was make it look elegant. I added about 3 inches to the length and because the fabric I used was see through, I cut out a lining as well but I cut it slightly shorter. I hemmed both pieces and stitched them together at the top before overlapping the front and making the casing. I put the outfit on the doll to check out the results, but something was missing. I quickly rummaged through my draws of knick knacks and found an old bracelet that was broken, pulled it apart and glued a pearl bead where the stone was missing. A few stitches later and the outfit was complete. I just had time for a quick photo before wrapping it up and getting down to the post office. The customer and I were so thrilled at the result that I just had to let you all know how easy it is to use an existing pattern and by making small adjustments or simply using different fabric, you can create an outfit that looks totally different. Who’d have thought – beach patterns for evening wear! The great news is that I have added this extra option onto my existing sarong pattern of both the 18 Inch American Girl Doll Clothes Pattern and the 18 ½ inch Cabbage Patch doll clothes pattern. Now it will be even easier for you to make this short sarong into a long sarong/elegant evening skirt because when you purchase this pattern, the two options will be there. Or if you have already purchased the pattern or my online course in the last 12 months, simply log on and you can print out the new updated version. Congratulations, you are too clever. It looks really great and it is really amazing what we can do with small amounts of material. Rosie, I can’t wait to try this new version of halter and sarong. It’s so much fun to use a favorite set of patterns and make slight variations in them. I love your patterns and have mixed and matched them to come up with some lovely items. I have a pattern for a pretty summer one piece romper. I wanted to make it look more for winter, so I used your crop top, the bottom of the romper, and a soft corduroy. Pair it with a long sleeve tshirt and you have a cute back to school outfit. It is great to see you experimenting with your patterns and mixing and matching things around. Please do send me a photo of the new romper when you make it as I love to see your creations and by sharing them you will be inspiring others to experiment with their patterns too. Rosie, I bought your course on DVD, can I still get the long sarong pattern? I also bought the course on DVD and would like to have the updated pattern, thanks Rosie! I’ve been working on the shorts and top outfit that goes with the course lately, lots of fun! It is great to hear that you have been having fun sewing the shorts and crop top from my course. I see that you were one of the first to buy my course on DVD, thanks. I will forward the updated sarong pattern to you via email. Happy sewing, Rosie. Hi Rosie, The evening outfit looks very elegant..thank you for the link to the pattern. I love the photo.